So as part of the season racing for Cotic we do a one off event called Steel City down hill. Its been run for 8 yrs now and and I think I've done 4 or 5 of them now. 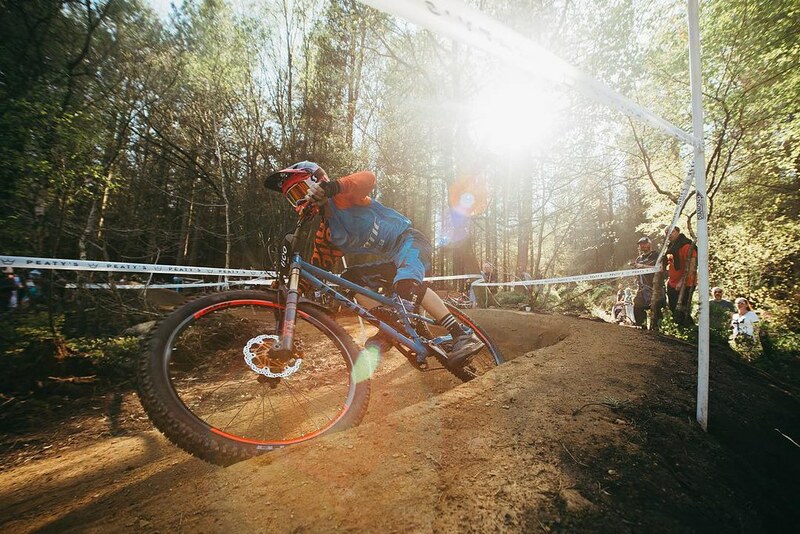 Its nick name is The Biggest Little Race In The World, as for one day every may Greno Wood in Sheffield has a atmosphere to rival Fort William World Cup. It's run by a group of mates called Ride Sheffield and it raises money for trail building in the region. Henry Norman, Nick Hamilton and Steve Hardcastle are the main men. Amazing work chaps. You're an inspiration. 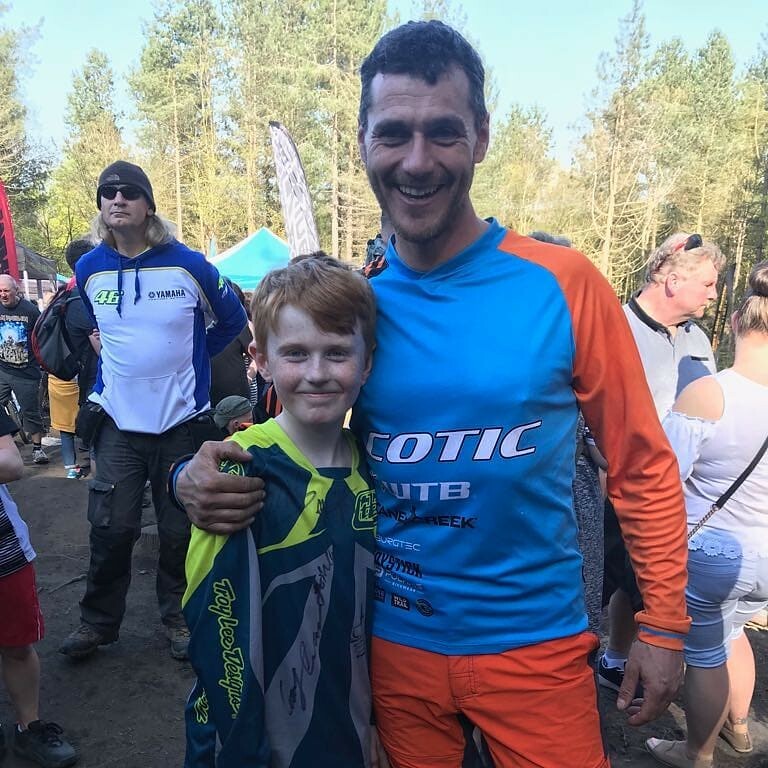 Its set in the woods just across from Steve Peat's house and every year he amazes us all keeps the kids at bay and seems to pull a win outta the bag, at 43 as we both are now. The gang of world class down hill riders, the spectators, and everyone else who took part all stand in awe as he seems to have that little extra to give. At just over a minute long its a very intense run and you have to produce your own piece of perfection to get a good result. A few years ago I won the master class so was bumped up to Pros. That gives me a mixed feeling. 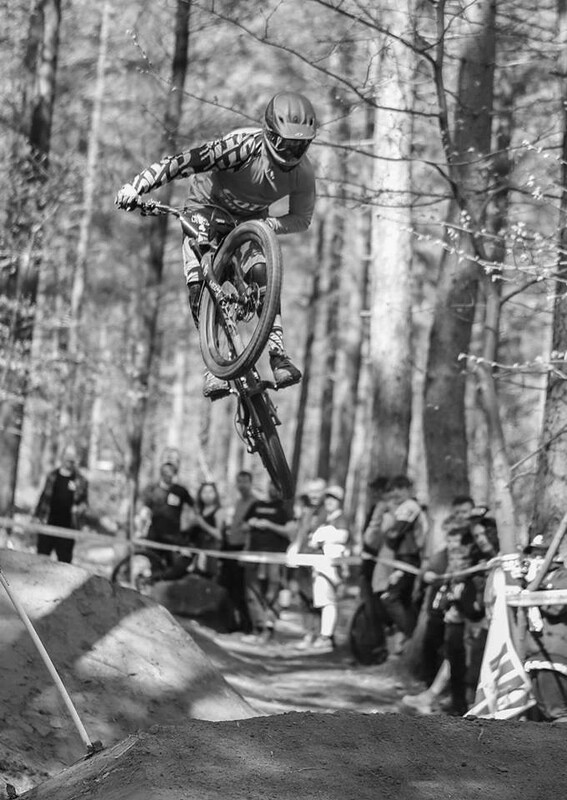 One the one hand, it's an honour to be chosen to ride against the full time riders and the rest of the class who are all very talented, but on the flipside, I race with a knowledge I’m probably never going to get on a step at the end. I did come close one a couple if years back with a 4th though. This year the race date fell on the anniversary of the passing of my mum and I’m pretty sure she gave me a helpful push where needed. Thanks Mum. The race weekend started for me on Friday afternoon. I decided that needing to know every bump of the newly surfaced and slightly changed track meant a trip to walk it, memorise what I could and just get the pumps and jumps in the right order. Word obviously went round that I'd been, as I had a fair ribbing off an ex-World Champion downhiller about sussing it out. The way I see it is I've nothing to loose and all to gain. I'm a 43 year old joiner, but when they get paid to ride bikes they should easy beat me!! After all I'm old enough to be most of 'em's Dad; him included!! Race day arrives. I wake up feeling like death as a good dose if cold takes hold if me. I feel horrible but a job has to be done. My bike is bolt checked, tyres are changed to suit the fast conditions and all is good. Praccy gets under way and the big double at the bottom of the track which caused lots of conversation was soon tamed. For me it was actually really easy as long as you carried the correct speed through the previous corners. (Note - this does not in the least bit mean it was easy. No one outside the race team at Cotic would dare hit it!!) A much needed lie down is needed as I feel even worse with sweat and snot oozing out. After a bit of sitting down and resting, race time soon comes around. We're off! Well I made a right balls of coming down the start ramp being in no where near the right gear. Nearly hit a tree changed up some and gave it the beans. The rest of the run went well but I knew if dropped a couple of seconds on that start. Result after 1st run 10th. Now the secret goal was to get top 10 and prove I had the speed to podium in at least the Vets, if not more of the classes. Roll on 3 hrs later which seemed to fly by and it's race run 2. This is seeded off 1st runs, so I'm 10th from last with Sam Dale behind me (World Cup downhiller). I suppose this should phase me, but as I see it he shouldn’t let little old me anywhere near him. 2nd run I have to say I nailed it. Can't pick fault with it: I went a second quicker. The crowd was amazing they roared and cheered all the way down. I'm sure that gives you that extra bit of speed. The noise is intense! It was the best I could have done. Final standing are I'm 11th in the Pros and 14th overall from 272 finishers. My time would have won the Vets by over 2 seconds, won Masters, podium in Senior and in all the other categories. Chuffed should be my mood, but why after a amazing day am I disappointed? Is it the fact i didn’t stand on that podium? As a racer, it's what we all chase. Is it that the Vets winner takes home a set of new wheels, but due to earning the right to be called a Pro i get nothing despite going faster than him? I do this to represent Cotic at races and get them advertising. Is 11th good advertising?!! It feels not when Swinny, Will, Wes, and Dave all smash amazing results in there respective classes. Why doesn't it feel good? Maybe its the cold making me feel grotty! Firstly, two old mates came to me separately and were full of admiration for how fast I went past them. They were both buzzing with excitement for me and compared me to some if the best riders in the world. My God Son want me to sign his shirt. He’d been round the pop stars and got all their autographs but i got the honour of writing "Uncle Chay". And I think that's worth a damn sight more than any medal/prize or podium. Cheers Thomas. You made my day. Well to answer Chay's question, 11th is fine advertising when it prompts features like this! We are all incredibly proud of our guys in orange and blue: every one of them. The marshall's at the big new gap (which did cause some mayhem!) told me "Every time I saw a blue and orange jersey, I knew I could relax for 10 seconds because they would be fine over the jump!". The rest of the guys did brilliantly as well. Swinny came 5th in Pros - just off the podium this time in a stacked field, and he was feeling ill too! Will came 3rd in Junior, Wes for 6th despite also feeling grotty. Gaz from A Line rallied his brand new Rocket to 4th in Masters despite a crash! As much as all of those results were mega, hats off how-the-hell-did-he-do-that run of the day for us for Brand Ambassador Dave Camus. 3rd in Senior....ON. HIS. BFe!. Awesome event, awesome riders, awesome crowd, awesome people.